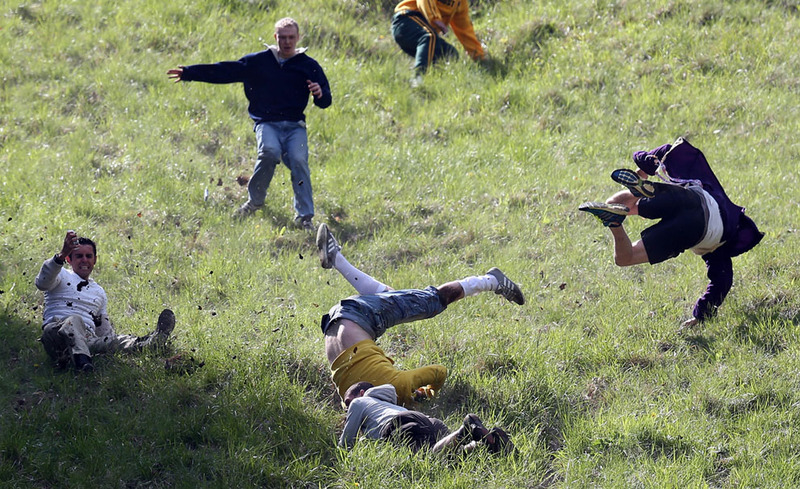 The Cooper's Hill Cheese Rolling and Wake is an old tradition in Gloucestershire, England. Contestants chase a wheel of cheese down a very steep slope, nearly 1:1 in parts, about 200m long. The British authorities have been trying to suppress the event for a decade. It is no longer held officially, since any organizers could be held liable for injuries. But it still goes on unofficially. So let's here it for the irrepressible cheese rollers. Lots of pictures here. The first volume of my first big report for the Park Service, on my four-year archaeological survey of the Prince William Forest Park in Virginia. This project has a special place in my heart because I did so much of it myself. Now my salary is too high for that, and I have to let less expensive people do most of the historical research and direct the fieldwork while I "manage." Back when I was cheap I spent days wandering around the woods by myself, looking for a lost plantation and other sites. The cover of this document is above, featuring one of my favorite photographs. The web site is nothing fancy, just links to all of this stuff. But now that they have this up and running I assume that creating new content for this site will be part of all my future NPS projects. The buzz in educational politics has lately been about Common Core, a set of nationwide standards for math and reading. These standards were developed by the National Governors' Association, with money from the Gates Foundation, and have been promoted by the Obama administration and by both George W. and Jeb Bush. The developers sought input from both teachers' unions and business groups. Common Core is, in short, a non-partisan effort from the usual set of elite institutions that guide national education policy. Now angry opposition to the standards is breaking out all over the country. The opposition is being led by Tea Party groups but endorsed by an array of populist leftists as well. The leftists mainly object to the program's emphasis on standardized testing, conservatives to its being a nationwide program that overrides state and local control. The politics is thus different from the usual left-right divide, and right now the loudest rhetoric on both sides is coming from Republicans -- Jeb Bush and the Chamber of Commerce for the standards, Tea Party groups against them. Some Tea Partiers have taken to calling the standards "Obamacore," but really his administration had nothing to do with developing them. I wonder if some of the people at the Tea Party rallies have any idea what is even in the Common Core standards. They look like innocuous bureaucratic stuff to me, and they are conservative in the sense that they stress basic skills like reading, writing, and very concrete math. So this strikes me as another example of the confusion in America over what conservatism means: decentralizaton and local tradition, or using the power of the state to promote national power, business interests, and the western intellectual tradition? I just learned today that besides roving around Mars looking for evidence of past life, the Curiosity mission included a careful measurement of the amount of radiation an astronaut would absorb during a trip to Mars. The instruments were inside the spacecraft, roughly the same environment as astronaut would probably ride in. Curiosity measured the exposure as 1.8 millisieverts per day. That's not so bad. According to NASA, lifetime exposure to 1000 millisieverts has a 5 percent chance of causing a fatal cancer. NASA's current rules limit astronauts to a dose of 660 millisieverts over their careers, which they say has a 3 percent chance of killing people. Using a powerful rocket, the trip to Mars could be made in 180 days. So a round trip could be made within NASA's limits, even allowing a few weeks on the surface and some time to train. 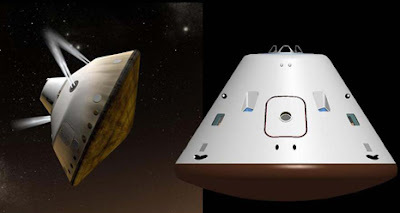 Shielding could also block some of the radiation, not to mention that plenty of people would be willing to risk even a 10 percent chance of cancer to be one of the first people on Mars. If this result stands up, the radiation problem is not the obstacle some people feared it would be. One caution is that Curiosity made the trip during a quiet solar cycle. A major solar storm would increase the exposure, but until a spacecraft with the right instruments flies through one, we won't know exactly how much. Consider the origin of birds. 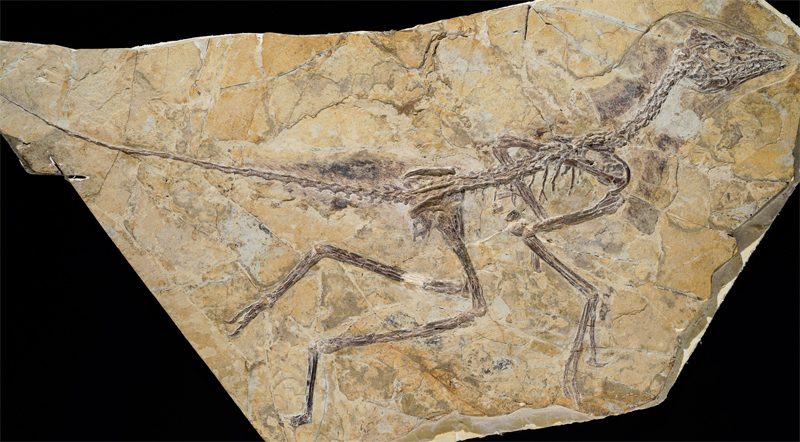 There is now overwhelming evidence that birds evolved from small predatory dinosaurs. Hundreds of stunning fossils illustrate the transitions from dino-fuzz to flight feathers and from grasping arms to flapping wings. The avialans (all birds, living and extinct) fit within a group of dinosaurs called the Paraves, which also includes dromaeosaurids (sickle-clawed predators like Velociraptor and Deinonychus) and troodontids (large-brained predators like Troodon). But which of these creatures were the first birds, and which specific group of paravians were their closest relatives? That’s still the subject of heavy debate. Three groups of paleontologists have recently drawn different family trees for birds and related dinosaurs. The version proposed by Xing Xu, the man behind all those Chinese feathered dinosaur fossils, puts the famous archaeopteryx, long considered the first bird, outside the avialans altogether. This would make this Chinese creature, Aurornis xui, the earliest known bird. To which the only rational response is to shrug and say "maybe." Our knowledge of these evolutionary connections has exploded in recent decades, and who knows how things will change when the next spectacular fossil turns up? 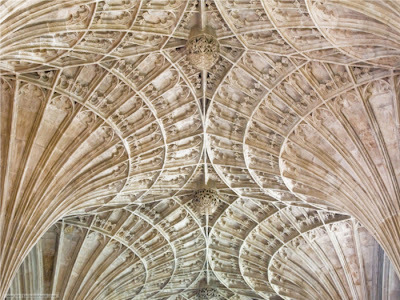 The history of science is full of debates that were waged with great intensity but then quickly forgotten when some good evidence was finally found. Right up until Apollo 11 landed, people were publishing papers staking out positions on what the lunar surface was made of, which is why Armstrong's first words as he went down the ladder were about the quality of the dust. I have the same position about human evolution, which is that it is just crazy to get invested in which very partial 2-million-year-old skeleton is a human ancestor and which a forgotten side branch. How could we possibly know? Many people really enjoy having firm opinions, and this is one vice that scientists seem to have in excess. A little humility would serve better than all this wrangling. 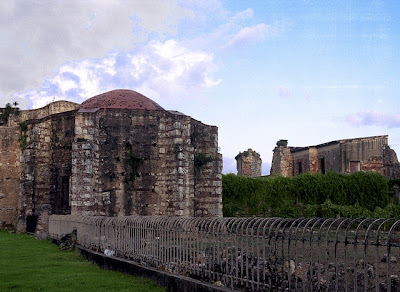 Santo Domingo, founded by Bartholomew Columbus in 1498 to serve as the capital of Spanish imperialism in the New World, boasts a great many firsts. 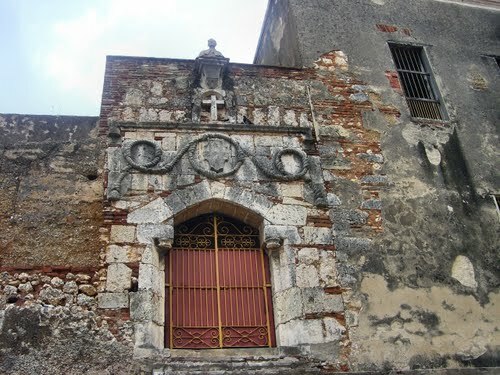 Among them is the first monastery in the Americas, Il Monasterio de San Francisco. Construction of the monastery began in 1512. The building of the grand, three-domed edifice was completed in 1544, after a series of delays caused by politics and funding shortfalls. But that was hardly the end of the friars' troubles. 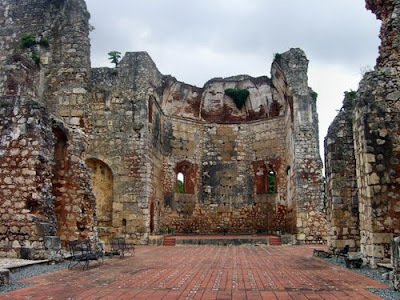 In 1586 the monastery was sacked and burned by Sir Francis Drake, who is referred to on all the Spanish-language web sites I have seen as "the English pirate." Rebuilt, it was then damaged by an earthquake in 1673 and flattened by a severe one 1751. The friars rebuilt again, only to be driven out by a force greater than earthquakes: secularism. The buildings were seized by the state in the 1880s and turned into an insane asylum. In 1931 it was battered so badly by a hurricane that it was shuttered and never re-opened, slowly decaying into the splendid ruin of today. I've been listening to the memoirs of Tony Judt, a British Jewish intellectual whose grandparents all came from eastern Europe. In 1965 he won a scholarship to King's College Cambridge. His parents opened the telegram and excitedly called him at a friend's house to tell him the news, then insisted that he come home to celebrate. He arrived home to find his parents in the middle of a furious argument. It turned out they were arguing over whose family had supplied the smarts that allowed their son to be such a good student. 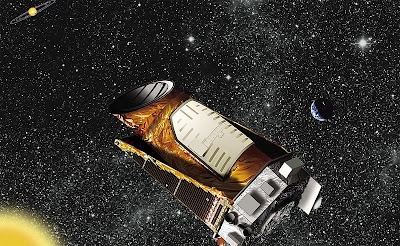 The Kepler spacecraft appears to be dead, done in by wheel bearing failures in two of the devices that aim it toward target stars. NASA has put the spacecraft in a "safe mode" that allows constant communication with the earth, in case the bearings decide to unfreeze or somebody thinks up a brilliant solution. But the team engineers seem very pessimistic. So farewell to one of the most extraordinary explorations in human history. In its four-year career Kepler has discovered more than 3,000 planets, eight times as many as had been discovered in all the millennia before it was launched. The official count of extra-solar planets is much less than that, but that is only because it is taking astronomers a long time to work through the mountain of data Kepler has beamed home. The first discovery of an extra-solar planet was not made until 1988. Until that time, worlds around other stars remained only a dream, and we had no idea how many there were. Based on what we have now learned about extra-solar planets, astronomers think there are at least 100 billion planets in the Milky Way Galaxy, perhaps 400 billion, at least 17 billion of them roughly the same size as Earth. Spectrographic analysis has already produced evidence of water and carbon dioxide in the air of a world 50 light years away; if we find a planet with a large amount of oxygen, we may well have found a world with life something like our own. Whatever else is wrong with the age we live in, it is the greatest age of scientific discovery, a time when wonders from the molecular machinery of the cell to planets around other stars have been mapped for the first time. Pet Lawsuits and "Emotional Damages"
The court performed something like a cost-benefit analysis to answer the Medlens’ perplexity that they could seek sentimental damages if a taxidermied Avery, rather than a living, panting Avery, had been negligently destroyed. The court noted that the American Kennel Club, in a friend of the court brief joined by the Cat Fanciers’ Association and other pet-welfare groups, warned against the unintended consequences of allowing “sentiment-based damages” for injured or destroyed dogs. They fear that “pet litigation will become a cottage industry,” bringing the danger of increased liability to veterinarians, shelter and kennel workers and even dog-sitters. . . .
One problem I can immediately see with pet litigation is that dogs don't feel the same pains we do. I used to own a dog that loved to kill rats, which regularly left her with a torn, bleeding face that bothered her not in the slightest. We have a neighbor whose dog was once involved in a scary, violent tussle with our dog, and now she picks it up and glares at us whenever she walks by our house, proclaiming that Freckles is petrified; Freckles, however, perks up and wags her tail when she sees our dog. The thought of being sued by Freckles' owner for the pain of seeing her dog attacked by mine gives me pause. More broadly, I have to say that I do not understand the whole business of paying people money to make up for "pain and suffering." What is the underlying theory here? That money makes people feel good, and therefore it can serve as a balm for any sort of emotional distress? But how much pain is worth how much money, and how do we know? Can any amount of money make up for the loss of a child? If not, why award $2 million? Americans are so used to this idea that most don't know the American system is nearly unique in the world. Nowhere else can people become rich because a sympathetic jury decided to award them a pile of cash. Nowhere else do tort lawyers regularly become millionaires. And this is why, although most things are more expensive in Europe, liability insurance is really, really cheap. I have a sense that we award "pain and suffering" damages as a way to somehow make up for the harshness of our mass society. We know that people are often lonely, sorrowful, oppressed by burdens, and struggling to make ends meet, so we feel for them when they lose one of the few people or things that give their lives meaning, and we try to ease their pain with the only tool that is readily available in our world: cash. Your letter … contained some amount of backbiting, name-calling and sneering. We refrained from wading into this battle in the past out of a hope that the crooked could be straightened by the easiest and softest means. … But the wound continued to bleed, and in fact increasingly bled, until your last letter arrived, ending any hope of stanching the wound and healing it. They also complained that he wouldn't answer his phone, failed to hand in expense reports, and refused to follow orders. A certain sort of conservative or curmudgeonly skeptic loves to bash renewable energy: windmills may be cute, but they are just not as serious as mining coal or drilling for oil. The objections people like to raise include cost, problems with the electrical grid, problems with variable supply, and so on. But renewable energy is not a hippie fantasy. Already today more money is being invested in renewable energy generation than in nuclear and fossil fuels combined, and the curves are rapidly diverging; worldwide, the investment in renewable power plants and associated infrastructure was $270 billion last year. 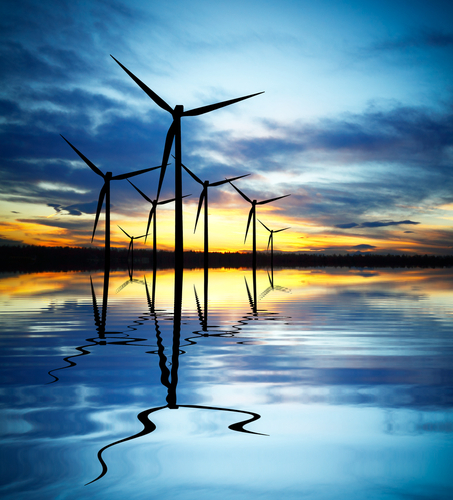 Two recent studies, one from the Department of Energy and one from the Rocky Mountain Institute, both found that the US is likely to get 80 percent or more of its energy from renewable sources by the end of the century. Both reports found that no new technological breakthroughs were needed, nor any major changes in the electrical grid. According to the feds, if we keep on doing exactly what we are doing now, with no changes in laws or carbon taxes or anything, the US will still get more than half its power from renewable sources by 2050. Given the huge investments companies around the world are making in energy technology, we should probably expect a game-changing breakthrough somewhere that will shift that curve even further. glass objects created by dripping molten glass into cold water. 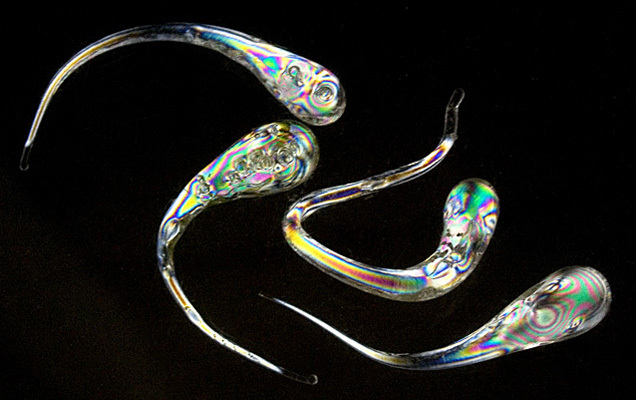 The glass cools into a tadpole-shaped droplet with a long, thin tail. The water rapidly cools the molten glass on the outside of the drop, while the inner portion of the drop remains significantly hotter. When the glass on the inside eventually cools, it contracts inside the already-solid outer part. This contraction sets up very large compressive stresses on the exterior, while the core of the drop is in a state of tensile stress. It can be said to be a kind of tempered glass. The very high residual stress within the drop gives rise to unusual qualities, such as the ability to withstand a blow from a hammer on the bulbous end without breaking, while the drop will disintegrate explosively if the tail end is even slightly damaged. Still photo of what they mean by "disintegrate explosively" above. Click on the image to watch the video, from Smarter Every Day. Very, very strange. From a nice gallery of nature photographs by Linda Davidson, all shot around Washington, DC. 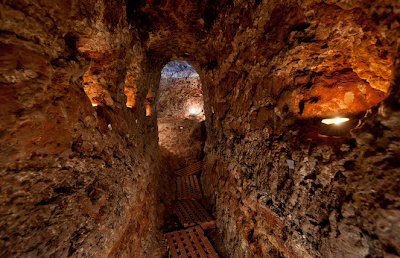 Last year archaeologists in France discovered an underground complex of tunnels and rooms cut into the rock beneath the village of Sublaines, in the district of Bléré-Val-de-Che. The network of tunnels and rooms extends for more than 50 meters (160 feet). Notice the niches for lamps in the picture at the top; there were also benches, planks on the floor, and a well for water. 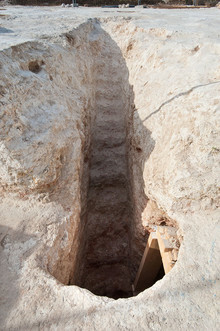 The tunnel entrance was concealed under a small post building. In the late 11th century this region was disputed between the Counts of Blois and Anjou, so there was a great deal of fighting. The archaeologists' theory is that these tunnels were built as a refuge and a place to hide valuables, perhaps by a family of well-off peasants or minor gentry. 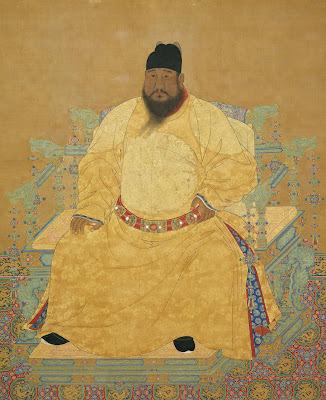 I find these fascinating because the technique is so different from western painting but the results still immediately recognizable as individual people. This sets me wondering about how much difference of style there can be in an image that still conveys something recognizable to our eyes. 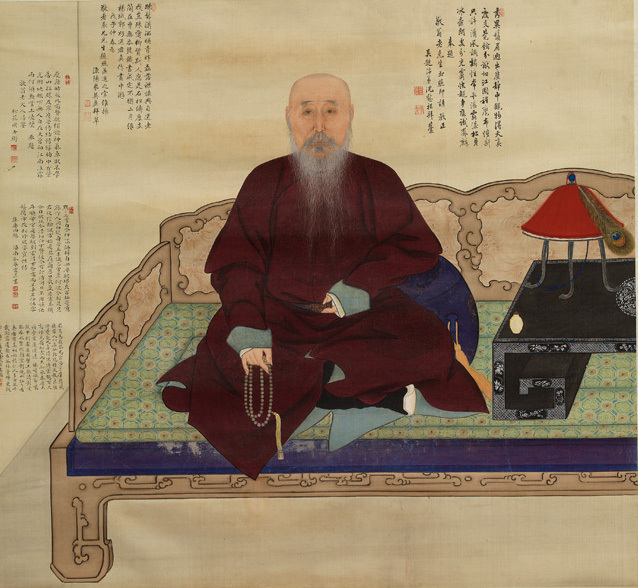 Above, Seated Portrait of the Emperor Xuanzong (1399-1435). Portrait of Ho Bun, sixteenth-century mandarin. 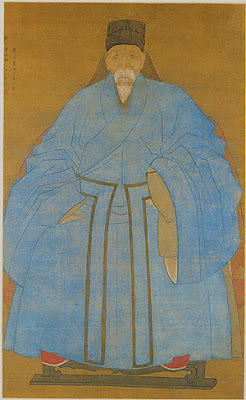 Portrait of the Elderly Master Jing, Royal Ontario Museum. 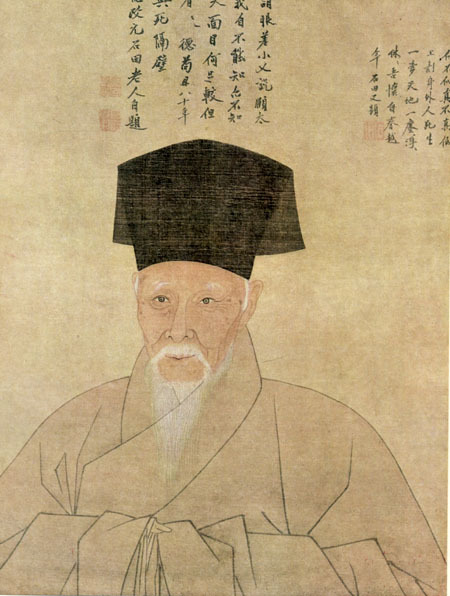 Portrait of the Artist's Great Grand Uncle Yizhai at the Age of Eighty-Five, by the mysterious painter who signed himself only Zude. Ming dynasty, dated xiyou (1561 or 1621). In the Met. Portrait of the painter Shen Zhou, one of the "Four Great Masters of the Ming," another example of the Chinese habit of making these numbered lists: the Four Spiritual Mountains, the Four Great Pottery Styles of the Sung (really), the Five Great Teachers, and so on. 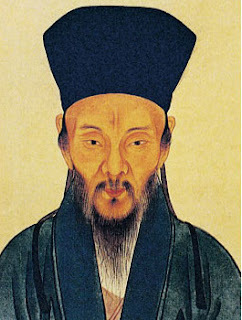 Shen Zhou seems to be in a good mood, no doubt because the emperor loved his work and made him rich. 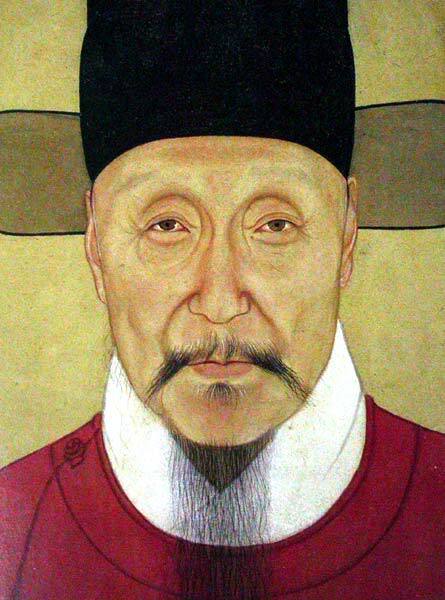 Wang Shouren, 1472-1529. According to the site where I found this portrait, Wang was a "master of subjective idealism." Sure. The familiar stark divide between people of religion and without religion is too crude. Many millions of people who count themselves atheists have convictions and experiences very like and just as profound as those that believers count as religious. They say that though they do not believe in a “personal” god, they nevertheless believe in a “force” in the universe “greater than we are.” They feel an inescapable responsibility to live their lives well, with due respect for the lives of others; they take pride in a life they think well lived and suffer sometimes inconsolable regret at a life they think, in retrospect, wasted. They find the Grand Canyon not just arresting but breathtakingly and eerily wonderful. They are not simply interested in the latest discoveries about the vast universe but enthralled by them. These are not, for them, just a matter of immediate sensuous and otherwise inexplicable response. They express a conviction that the force and wonder they sense are real, just as real as planets or pain, that moral truth and natural wonder do not simply evoke awe but call for it. . . .
What, then, should we count as a religious attitude? I will try to provide a reasonably abstract and hence ecumenical account. The religious attitude accepts the full, independent reality of value. 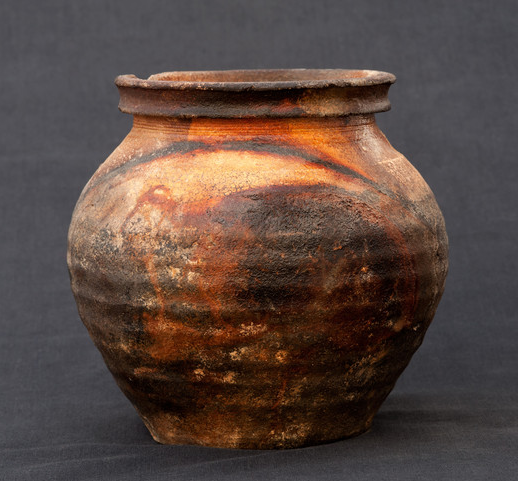 It accepts the objective truth of two central judgments about value. The first holds that human life has objective meaning or importance. Each person has an innate and inescapable responsibility to try to make his life a successful one: that means living well, accepting ethical responsibilities to oneself as well as moral responsibilities to others, not just if we happen to think this important but because it is in itself important whether we think so or not. The second holds that what we call “nature”—the universe as a whole and in all its parts—is not just a matter of fact but is itself sublime: something of intrinsic value and wonder. Together these two comprehensive value judgments declare inherent value in both dimensions of human life: biological and biographical. We are part of nature because we have a physical being and duration: nature is the locus and nutrient of our physical lives. We are apart from nature because we are conscious of ourselves as making a life and must make decisions that, taken together, determine what life we have made. About this I am unsure. In some moods I feel certain that intelligent life does have some value, but in others I admit that I cannot really know this. Sometimes I feel that people really do make decisions, but other times I think that this is just mystifying language covering the operations of causality and chance. One day I am awed by the power of religious practice, religious language, and religious art, but the next it all seems ridiculous. I do think of my own convictions and interests as religious in the definitional or legal sense. I do not believe that there is such a thing as a non-religious way to teach biology. Believing that there is some value in discovering and teaching the truth about evolution is in itself a sort of religion. Scientists sometimes justify their ideas as useful, but that is not why they hold them; they hold them because they see a real value in the truth quite apart from whether it has any use at all. What is the use of knowing that dinosaurs were related to birds? None. It is only wonderful. That is where I always end up. To me, the universe is wonderful, and the opportunity I have had to experience and learn about it is a very great miracle. American photographer Arthur Drooker (born 1954) takes wonderful pictures of ruins. His first book, American Ruins (2007), won a stack of well-deserved awards. Above is Dungeness Plantation, Cumberland Island, Georgia. Below is Bannerman Castle, Pollepel Island, New York. He followed that up with Lost Worlds (2011), photographs of ruins in the Caribbean, Central, and South America, which I just got out of my library. It's marvelous from beginning to end. 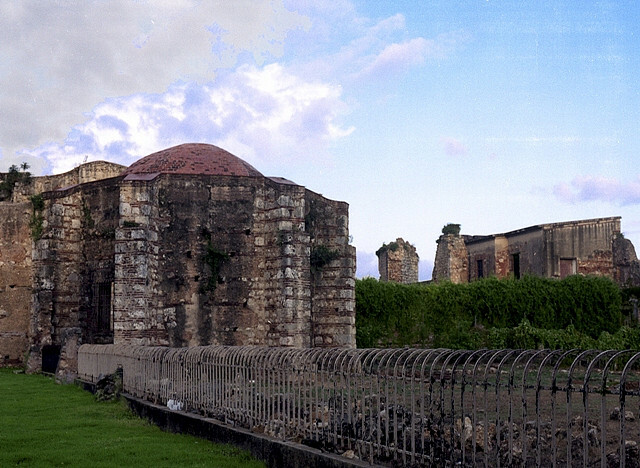 Above is Sans Souci, the royal palace of the short-lived Haitian monarchy; below is the hospital of San Nicholas de Bari, Santo Domingo. I celebrated my day off today by taking Ben and Clara to explore the creek. It was a perfect day: sunny but not hot, hardly a bug to be seen. We saw deer, lots of birds, at least ten crayfish, and raccoon paw print. I think everyone had a terrific time. Series of striking images from Japanese photographer Yamamoto Masao. More at his web site. From 2000 to 2012, the annual production of master’s degrees jumped 63 percent, federal data show, growing 18 percentage points more than the output of bachelor’s degrees. It is a sign of a quiet but profound transformation underway at many prominent universities, which are pouring more energy into job training than ever before. The master’s degree, often priced starting at $20,000 to $30,000, is seen by some universities as a moneymaker in a time of fiscal strain. It is seen by students as a ticket to promotions or new careers. For them, the lure of potentially increasing their salary by many thousands of dollars a year outweighs the risk of taking on large tuition bills and possibly debt. Some universities around Washington, including Georgetown and George Mason, now award more master's degrees than bachelor's. Meanwhile, more and more employers are asking for an MA, on the theory that people with BAs don't really know anything. Within my own field the need for a MA has steadily crept down the ladder. When I started only the principal investigator needed one, but now most places want a field supervisor to have one, too. Many nurses now get an MS in nursing, and it is even possible now to get a Ph.D. in nursing, confusing everyone to no purpose. Our country has gone mad for credentials. To get a job you have to have more years of school, more certifications, and more experience than in the past, even when this has nothing to do with how you will perform on the job. There was an ad that flew around the web last year for a position as an assistant manager at a McDonald's, requiring a BA and four years experience at managing a McDonald's. The education field has been shaken up by the discovery that although schools pay teachers more for having a master's degree or being certified or having decades of experience, these things have no impact whatsoever on how much their students learn. Thinking about the future, I imagine this will only get worse. It is the almost inevitable outcome of our steadily bureaucratizing, ever more anonymous world. We don't know or trust each other any more, we just read each other's resumes. We don't want to train people, for fear they will just take their training and go elsewhere. We don't judge each other's skills or evaluate each other's work or figure out what other people are capable of doing -- that would be too much trouble. We just demand a master's degree. 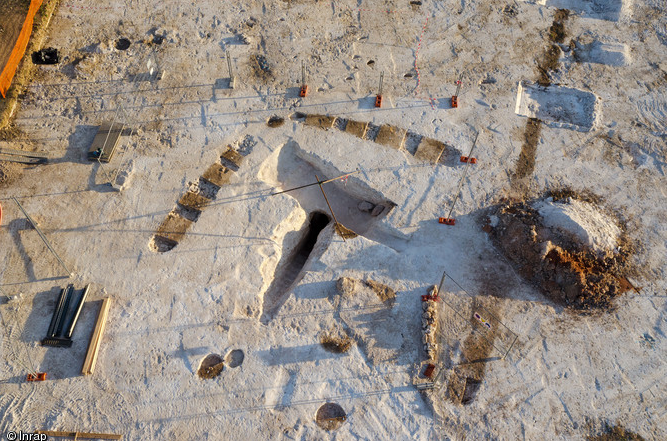 eviscerates the walls of abandoned buildings, conjoining rooms with massive holes, and uses leftover fragments to create densely textured walls and surfaces. In the last photo, a project entited Destroyed House, Teeuwen removed the walls from a post-war apartment block in Amsterdam and sawed the building’s doors into hundreds of fragments, using them in turn to construct layered partitions. Walls made from doors. In other works she uses countless objects crammed into small rooms, creating claustrophobic spaces that appear on the verge of collapse, putting any contemporary hoarder to shame. I supposed that prose comes from some gallery's promotional press release, and the poor hack who wrote it will get no credit even as it spread throughout the art world. Is he or she proud to be quoted everywhere, or annoyed by the theft? I would be proud myself, but I would understand a certain level of annoyance. Anyway, these images of Teeuwen's are striking and highly original. 44 minute video on the artist's work here. 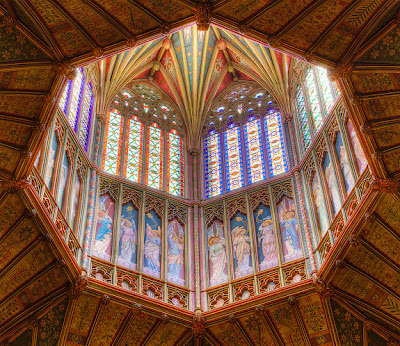 Ely Cathedral in Cambridgeshire, England is a huge church in pretty much the middle of nowhere. 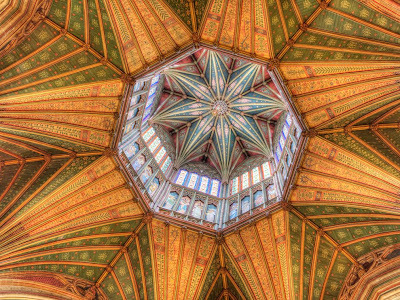 This puzzles us moderns, but Ely was founded as a monastery and the isolation was part of the point. This area was known in the Middle Ages as the "Isle of Ely" because it was dry land largely surrounded by rivers and marshes. At various times it was a virtually independent "liberty," where the abbey held almost all the powers of the crown. The monastery at Ely was founded by Queen Etheldreda of East Anglia. She was one of those early medieval princesses who wanted nothing to do with the dynastic marriages planned for them by their families. Etheldreda, devoted to God from her childhood, let her family wed her to two successive noble husbands but insisted on remaining a virgin. The first husband does not seem to have objected to her chastity, but the second eventually decided that he wanted a more normal marriage. Etheldreda ran away to a nunnery, and the next, year, 673, she founded her own double monastery (monks and nuns) on her dower land at Ely. This was sacked by Vikings and largely destroyed, but then refounded by King Edgar the Peaceable in 970 as the richest monastery in Britain. It became a cathedral as well in 1107. 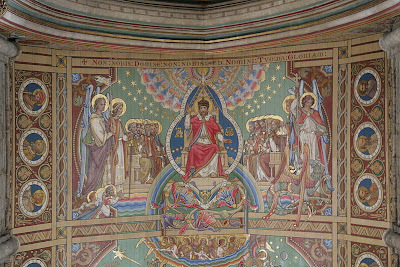 Etheldreda became a saint, of course. Over the centuries the pronunciation of her name slowly changed, until in Elizabethan times it came out as Audrey. St. Audrey's Fair became notorious in those times for the tacky cloth sold there, and by 1655 the word "tawdry" had come into English as a word for ugly, brightly-colored stuff no proper person would wear. Strange are the ways of fate. The current church has a long and complex history. The oldest parts date to the 11th century. The Norman church was less than half the size of the current one; the nave was added in the Gothic style in he 13th century. Then in 1322 the church's central spire collapsed, bringing much of the church down with it. This led to a major rebuilding. The spire was replaced by the famous octagonal lantern. Then in the 1839 a bunch of gung-ho Victorians launched a big restoration push. 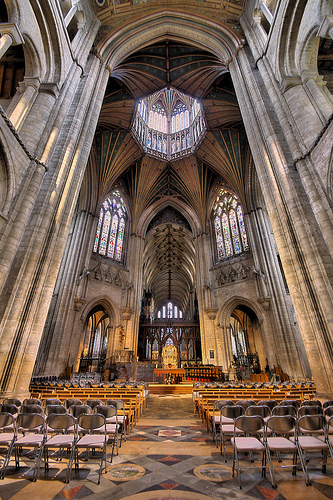 They set about "restoring" the cathedral to its medieval appearance, as they imagined it. Most of the original stained glass was gone, replaced by clear glass; these folks put in new stained glass. They installed the painted wood ceiling, a piece of which is shown above. The painted all sorts of other stuff, too, like the wood of the lantern. So what you see when you go to the cathedral is as much Victorian as medieval. On the other hand, when you go to a completely authentic medieval church, where nothing has been added, you are not seeing what medieval people saw. 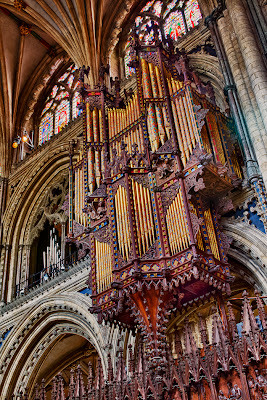 These chuches were originally painted, usually in bright colors, and they were full of extra stuff, from rood screens to stalls selling pardons or beer. 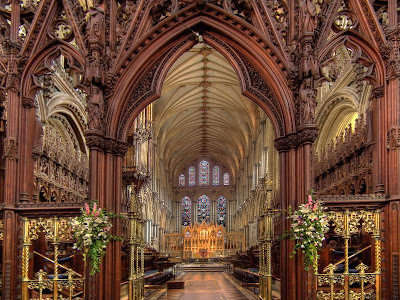 In that sense, what you see at Ely is less authentic than in the average cathedral, but more medieval. 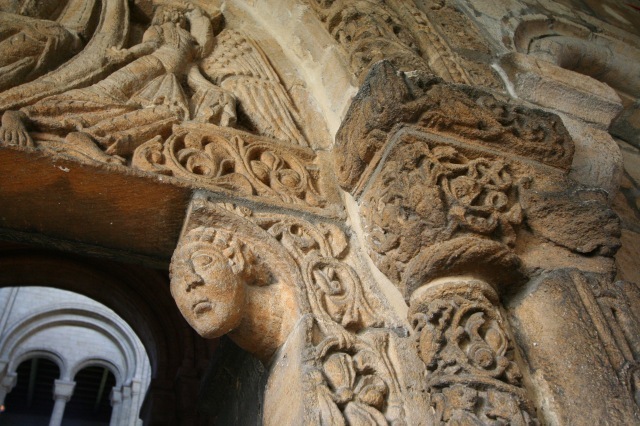 And there is still lots of medieval stuff, like the carvings above on the Prior's door. I didn't know any of this when I visited, 22 years ago, and at first I was disappointed by all the Victoriana. But then I decided that I just liked the church the way it is. What is the Benghazi Scandal About? Why Don't Americans Move Any More? Send a Kid to College. . . .